Group A and Group B at the 2018 FIFA World Cup saw their conclusions today as all eight teams faced off for the final time in this round of matches. Portugal, Russia, Spain and Uruguay and are all through to the Round of 16 after their results today. In what was deemed as Russia's first real test of the tournament, the hosts were swept aside by Uruguay and went down by three goals to the eventual group winners. Uruguay got off to a great start when Luis Suárez' low free-kick found its way into the back of the net in the tenth minute. Denis Cheryshev should have equalized for Russia two minutes later but his effort went straight to Fernando Muslera and Diego Godín cleared away the rebound. Uruguay then went up by two goals in the 23rd minute when Diego Laxalt's shot deflected off of Cheryshev and past his goalkeeper for an own goal. Things went from bad to worse for Russia as Igor Smolnikov received his marching orders after a bad tackle on Laxalt led to his second yellow of the match. 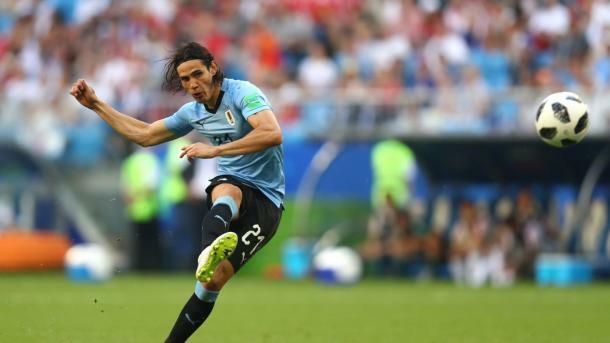 Edison Cavani, who had been unlucky not to have scored until today, finally broke his duck at the competition when he was the first to the rebound in the 90th minute after Godín rose highest to meet a corner kick and had his effort saved by the goalkeeper. The other match in Group A saw Saudi Arabia score a late goal to consign Egypt as the last place finishers in the group. Mohamed Salah started things off in the 22nd minute when he raced onto a long ball and chipped the goalkeeper to give Egypt the lead. Salah could have made it two in the 24th minute when he again beat the offside trap but this time, his lob over the goalkeeper went wide. 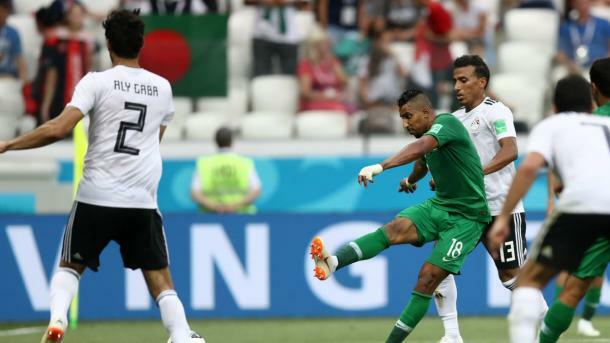 Essam El-Hadary, the oldest goalkeeper to make a World Cup appearance, then made a fantastic stop in the 41st minute to prevent Salem Al-Dawsari from converting his penalty. Saudi Arabia were then rewarded another penalty thanks to VAR and this time Salman Al-Faraj made no mistake from the spot. Saudi Arabia continued to push for a winner and Al-Dawsari made up for his earlier miss when he popped up in stoppage time to score from a narrow angle. Uruguay will head into the next round to face off against Portugal while Russia have to contend with Spain in the first stage of the knock out matches. For Egypt and Saudi Arabia, an early plane home is in their future as they failed to qualify out of the group stages. Iran and Morocco did not make it easy for either Portugal or Spain but in the end, the two Iberian nations had enough to see them through to the Round of 16. Late drama in both matches allowed Spain to finish top of the group despite being level on points with Portugal. An early mistake by Sergio Ramos allowed Khalid Boutaïb to race clean through on goal and finish well past David De Gea to put Morocco ahead in the 14th minute. Isco answered almost immediately for Spain after some lovely build up let Andres Iniesta glide into the box before he found the Real Madrid CF man inside the six yard area. 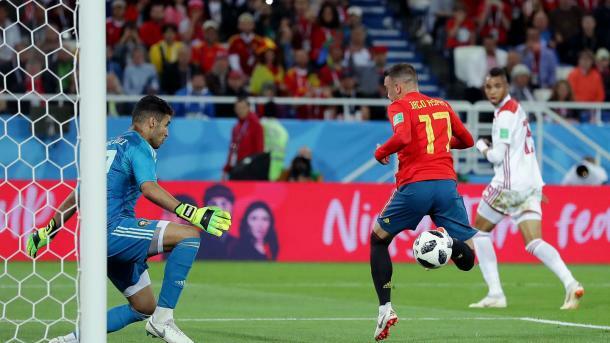 Morocco continued to test Spain's backline and could have honestly scored more had it not been for some great saved by De Gea to keep things from getting out of hand for Spain. The pressure did finally tell though as Youssef En-Nesyri rose above Ramos in the 81st minute to nod home powerfully from close range. Morocco kept pushing forward to find the goals that would put them through at the expense of Spain but it was Iago Aspas who found the last goal of the game in extra time with a cheeky finish that was allowed to stand after video review. In the other match of this group, a tempestous 1-1 draw was the result as Portugal finished second despite the result against Iran. Ricardo Quaresma. Quaresma combined with André Silva at the edge of the box before curling in a lovely shot with the outside of his right boot to put Portugal ahead right on the stroke of half-time. Cristiano Ronaldo should have extended Portugal's lead in the 53rd minute but the Portuguese captain proved that he is human after all when his penalty was well-saved by Alireza Beiranvand. Portugal would come to rue that miss as in the dying minutes of the game, Iran were awarded a penalty after VAR ruled that Cédric Soares had handballed inside the 18-yard area. Karim Ansarifard stepped up and did what Ronaldo had failed to do previously, bringing his country back on level terms. Ansarifard almost caused mayhem again as he was the width of the post away from giving Iran an unlikely victory which would have sent them through and put Portugal out of the tournament but it was not meant to be. 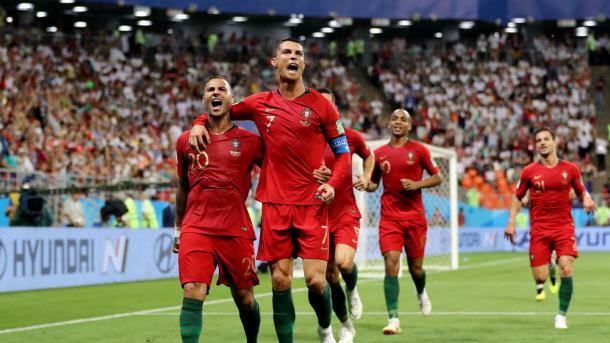 Tempers had flared throughout the entirety of the match as both sides gave as good as they got but in the end, Portugal did just enough to advance to the knock out stages. Both Iran and Morocco produced some outstanding soccer during the World Cup and fought until the very end to try and keep their dreams alive at the competition. Unfortunately, both nations' journeys have come to an end today and they are now out of the World Cup.